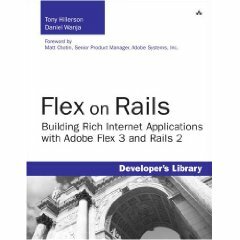 If you know Rails and Flex, and if you are desperately looking for a book that can guide you to Integrate Flex and Rails, then this is the book to buy. I was actually waiting to read the book Enterprise Flexible Rails, but as you can see, the book will not be published. A colleague of us came across the link flexonrails.com and immediately we bought the book from the local store for our company. Firstly, I would like to appreciate the authors for the sample code published in GitHub. They are ready to serve and very well organized. It has a right combination of addressing Flex and Rails. This book can sure help you to build enterprise level Flex based application with Rails backend. Chapter 8 is very useful in getting an overview of Cairngorm and PureMVC, and the sample codes were also driven with it. While the first part of the book gives conceptual details & foundations, the second part of the book gives useful recipes. Especially Authenticating, server push with Juggernaut, File Upload and so on.